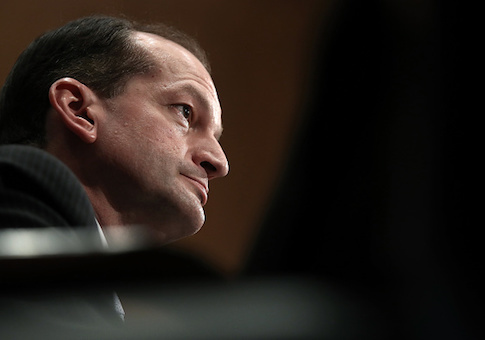 Congressional Republicans are asking newly minted Labor Secretary Alexander Acosta to roll back one of the Obama administration's most controversial regulations. Rep. Phil Roe (R., Tenn.), a member of the House Committee on Education and the Workforce, sent a letter to Acosta on Tuesday asking him to end the department's proposed Fiduciary Rule, which would allow regulators to oversee the actions of retirement advisers. Opponents of the regulation argue it will drive up the costs of maintaining advisers for smaller investors. "One of the primary concerns that our oversight exposed is that financial advisers would be forced to move from commission-based advisory accounts to fee-based advisory accounts, and that advisers would be unlikely to afford to continue providing advice to small, fee-based accounts," the letter, signed by Roe and 123 other U.S. representatives, stated. "We strongly urge you to delay this rule in its entirety." The Labor Department adopted the rule in 2016 under the leadership of then-Labor Secretary Tom Perez, who now leads the Democratic Party. Perez hailed the rule as "historic" in an exit memo posted to the White House website in the closing days of the Obama administration. He said the rule was designed to protect consumers from financial advisers who steer them toward trades or investments that come with more lucrative fees. "In 2016, the Department took a historic step to protect the savings of America’s workers—the conflict of interest rule makes sure that professionals providing retirement investment advice have to give advice that’s in the best interest of their clients and not divert their clients’ hard-earned income into their own pockets through hidden fees and conflicted advice," he said. Roe and his colleagues are now asking the department to end the rule. They argue that brokerage firms that manage retirement accounts have already begun preparing for the rule by boosting account minimums, which could freeze small investors from having access to financial advisers. "This rule will have significant consequences for our constituents, many of whom would prefer to continue receiving advice that was previously available," the letter said. "Long-term certainty is critical for investment advisers to be able to offer sustainable retirement advice models, and with many firms preparing for nearly a year for implementation of the original rule, many firms are now in limbo as to whether to continue with plans to implement more restrictive retirement-advice plans." Labor watchdogs also have called for an end to the rule. The pro-free market Competitive Enterprise Institute objected to the rule on the grounds that the agency overstepped its power to bring financial advisers under the Labor Department's umbrella. "The DOL clearly went beyond its authority from Congress by regulating the entire retirement system of 401(k)s and individual retirement accounts," CEI scholar John Berlau said in a statement following Acosta's confirmation on Thursday. "Secretary Acosta should make sure this review is thorough and complete before the rule takes effect, so middle class savers do not suffer unnecessarily." The Trump administration ordered a review of the rule in February. The department delayed its implementation for 60 days in April. If Acosta does not block the regulation, it will go into effect on June 9. This entry was posted in Issues and tagged Alexander Acosta, Department of Labor. Bookmark the permalink.